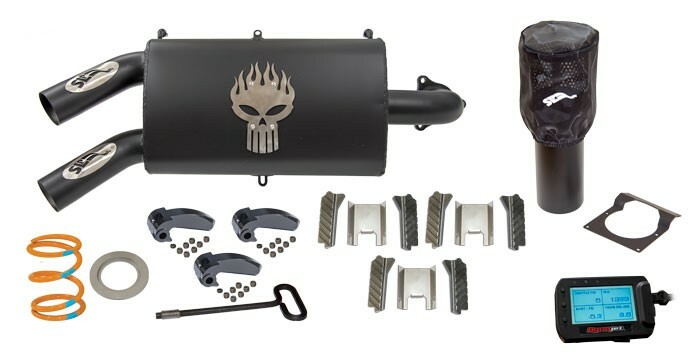 Punish the completion with the sharp performance that this Stage 2 Performance kit provides This kit combines the SLP performance muffler, clutch kit and a DynoJet Power Vision which allows you to safely turn up the boost for more horsepower output while remaining compatible with 91 octane pump fuel. The unique design of this SLP silencer provides 42% more airflow and gives the engine a "lopey" sound at idle with a pleasing roar at RPM. Couple these parts together with the SLP Clutch Kit and you get an extremely responsive, consistent, powerful machine that can take on most any challenge the trail or sandbox may offer. For closed course competition use only.